Pneumonia is an infection of one or both lungs caused by germs. It’s often a complication of the flu and can be life-threatening for people with mesothelioma. A person with pleural mesothelioma is more likely to get lung infections such as pneumonia and experience serious complications. Anyone can get pneumonia, but some people are at higher risk than others. Older adults — especially those with chronic respiratory diseases or cancer — are at high risk for pneumonia. Many cases of pneumonia are a complication of viruses such as the flu. Other causes include bacteria and fungi. There are more than 30 different causes of pneumonia, according to the American Lung Association. Symptoms of pneumonia vary from mild to severe. People in overall good health can recover from pneumonia in one to three weeks with antibiotics, anti-viral drugs or over-the-counter medications. However, older adults, people with weakened immune systems and people with serious medical problems are more likely to have complications from pneumonia. The lungs do not fight off infection as well in cancer patients. Mesothelioma patients who develop the flu have a higher risk of developing life-threatening complications such as pneumonia. Most patients with malignant mesothelioma ultimately die from pneumonia, respiratory failure or heart complications. Many germs can cause pneumonia. Bacteria or viruses cause most pneumonia, but fungi can also cause the illness. Mesothelioma patients and other people with weakened immune systems are more susceptible to these causes. Having one type of pneumonia doesn’t prevent a person from having another type. Patients with viral pneumonia also have a higher risk of getting a bacterial infection. Bacterial pneumonia is caused by bacteria that works its way into the lungs and then multiplies. It can develop on its own or during a cold or the flu. Several types of bacteria can cause pneumonia. The leading type is Streptococcus pneumoniae, which can enter the lungs through inhalation or through the bloodstream. Haemophilus influenzae is the second-most-common type of bacterial pneumonia. It may live in the upper respiratory tract and doesn’t usually cause illness unless you have a weakened immune system. Despite the name, this bacterium does not cause influenza (the flu). Exposure to these types of infections can occur in a medical setting (hospital-acquired pneumonia) or outside a health care setting (community-acquired pneumonia). Respiratory viruses cause roughly 33 percent of pneumonia cases in the U.S. each year. Most cases of viral pneumonia are mild and only last a short time. However, pneumonia caused by the flu may be severe and sometimes fatal. In this case, the flu virus invades the lungs and multiplies. The flu is the most common cause of viral pneumonia in adults. Viral pneumonia is most serious in people with pre-existing conditions such as lung disease or cancer. Fungal respiratory infections are caused by a fungus. They are most common in people with immune systems impaired by cancer chemotherapy, infections, such as HIV, or medications that suppress the immune system. Fungal pneumonia occurs after a person inhales spores of a fungus or by the reactivation of a latent infection. Opportunistic fungal organisms such as Histoplasma capsulatum, Coccidioides immitis and Blastomyces dermatitidis can cause fungal infection in healthy people and those with compromised immune systems. Rare types of pneumonia include mycoplasma pneumonia and tuberculosis pneumonia. Mycoplasma are not classified as bacteria or viruses but usually have traits of both. A type of bacterium called Mycobacterium tuberculosis causes tuberculosis, and it is an infectious disease that usually attacks the lungs. It rarely causes pneumonia, but when it does, it is extremely dangerous unless treated early. Certain chemicals, gases or excessive dust can increase a person’s chance of developing pneumonia. 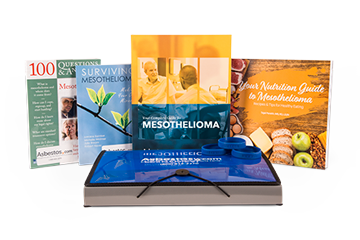 Information on mesothelioma, treatment options, legal help, nutrition tips and much more. Symptoms of pneumonia can vary depending on the type of germ that caused it, the patient’s age and overall health. Severe symptoms of bacterial pneumonia include a fever as high as 105 degrees, profuse sweating and rapid breathing and heart rate. A patient’s lips or nailbeds may appear bluish in color because of a lack of oxygen in the blood. Viral pneumonia symptoms are the same as flu symptoms at first. Within 12 to 36 hours, patients experience increased shortness of breath and a worsening cough that produces a small amount of mucus. A high fever and blueness in the lips may also occur. The common and severe symptoms of pneumonia closely resemble symptoms of late-stage pleural mesothelioma. Pneumonia is one of the most common mesothelioma misdiagnoses. Mesothelioma and many cases of pneumonia share pleural effusions, or excess fluid in the space that surrounds the lungs. A pleural effusion caused by pneumonia is called a parapneumonic effusion (PPE). A 2007 study published in Clinical Infectious Diseases reports 20 to 57 percent of the 1 million people hospitalized with pneumonia each year in the U.S. develop PPE. Approximately 90 percent of mesothelioma patients have pleural effusions, which can cause shortness of breath, dry cough and sharp chest pains. It is important to know the symptoms of mesothelioma and seek a second opinion from a specialist if you believe you’ve been misdiagnosed with pneumonia. Mesothelioma patients typically have more treatment options available and a more favorable prognosis if the cancer is diagnosed in the early stages. How Does Pneumonia Affect Mesothelioma? Fighting off pneumonia can be very difficult for mesothelioma patients. When a person diagnosed with mesothelioma gets pneumonia, it may delay cancer treatments. Chemotherapy can weaken the body’s immune system. Contracting pneumonia before mesothelioma surgery may delay or cancel the procedure, depending on the how sick the patient gets. Mesothelioma patients can also get pneumonia from surgery or from frequent trips to the hospital or clinics, where bacteria and airborne viruses are prevalent. Telling the difference between pneumonia symptoms and mesothelioma symptoms may be difficult because they are so similar. Mesothelioma patients should call their doctor right away if they believe they have pneumonia. If you have pleural mesothelioma and develop pneumonia, your treatment will likely be the same as someone with pneumonia who doesn’t have cancer. The goal is to treat the cause of the pneumonia. Bacterial pneumonia can be treated with prescription antibiotics such as azithromycin, clarithromycin or erythromycin. Antibiotics won’t work for viral pneumonia, but a doctor may use anti-viral medications. Severe symptoms of pneumonia can be treated with oxygen therapy or antibiotics through an IV. Our Patient Advocates can help you find a qualified mesothelioma doctor or cancer center closest to you. How Can Mesothelioma Patients Prevent Pneumonia? There are several things mesothelioma patients can do to reduce their risk of getting pneumonia. Get a flu shot. The Centers for Disease Control and Prevention recommends people with cancer get a seasonal flu shot. Preventing the flu can prevent viral pneumonia. Wash your hands regularly. You should wash your hands after blowing your nose, after going to the bathroom and before eating or cooking. Don’t smoke. Smoking can worsen the symptoms of mesothelioma and damage your lungs’ ability to fight infection. Maintain healthy habits. Getting plenty of rest, exercising regularly and maintaining a healthy diet helps prevent infection and can promote fast recovery if you do get sick. Get the pneumococcal vaccine. This vaccine is recommended for adults at high risk of pneumococcal diseases, including meningitis, bloodstream infections and pneumonia. There are two types of pneumococcal vaccines: PCV13 and PPSV23. Mesothelioma patients should talk to their oncology team before getting a flu shot or pneumococcal vaccine to make sure it’s the right decision. American Lung Association. (2018, March 30). Diagnosing and Treating Pneumonia. American Lung Association. (2018, March 30). What Causes Pneumonia? American Lung Association. (2018, March 30). Preventing Pneumonia. American Lung Association. (2018, March 30). Pneumonia Symptoms, Causes, and Risk Factors. Centers for Disease Control and Prevention. (2017, September 6). Pneumococcal Vaccination. Centers for Disease Control and Prevention. (2016, May 23). Flu Symptoms & Complications. National Heart, Lung and Blood Institute. (2017, August 22). Pneumonia. HealthLine.com. (2015, May 31). Understanding Pneumonia with Lung Cancer. Sahn, S. (2007, December 1). Diagnosis and Management of Parapneumonic Effusions and Empyema. American Cancer Society. (2017, February 10). Should People With Cancer Get a Flu Shot? How Does it Affect Mesothelioma?